At present everyone is using the bulk of ice. We are using the ice in many places like hotels, hospitals, etc. With the refrigerators, we can’t get that much of ice. So, Whenever you want a large amount of ice we can use ice maker. It produces Ice with different sizes and quantities as per your requirements. Ice Maker is a stand-alone appliance for making ice on a Large Scale quickly and easily. In Western Countries, many people are using these ice makers. There are various types of Ice Maker Machines. One of the best Portable Ice Making Machines is Whynter IMC-270MR Compact Portable Ice Maker. Here we gave the brief details of this product. The Whynter IMC-270MR Portable Ice Maker is a highly compact and affordable unit designed for space constrained use in your kitchen, home bar, and office. Whynter is the best Manufacturing Company which produces the various Products like Air Comfort, Life Style, Out Door Living, and Refrigeration. Whynter brings exceptional products that make your day a little easier and comfortable. This Company product primarily designed for Portability and Space Utilization purposes. The Whynter company provides Flexibility while using products. This company always committed offering full quality products. Whynter IMC-270MR ice maker will produce the perfect bullet-shaped ice cubes quickly and efficiently. 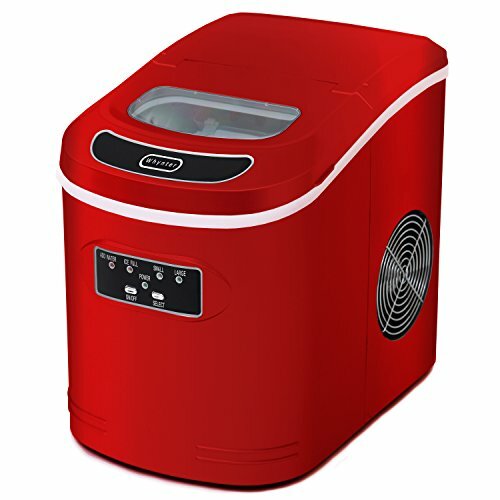 The Whynter IMC-270MR Compact Portable Ice Maker can produce up to 27 pounds of ice per day. You can select between 2 sizes of ice bullets depending on your preferences. This portable ice maker does not need direct plumbing. Simply fill the 2.2-liter reservoir with water, choose your ice size and watch the Whynter IMC-270MR Compact Portable Ice Maker make your first batch in as little as 10 – 15 minutes. Ice Storage Capacity 1.5 lbs. Whynter IMC-270MR ice maker produces bullet-shaped ice. The default cube size from the factory is set to large. Each time when you press this button the cube size selection will change between Small and Large. The chosen mode shall stay as selected unless changed or there is a power failure. For the most efficient operation when the ambient temperature is below 59ºF, use the small cube size setting. The indicator below POWER will illuminate green when the unit is turned on. The indicator below the selected cube size will be illuminated green. The Whynter IMC-270MR Compact Portable Ice Maker automatically checks the water level in the water reservoir. If the water level is too low, the indicator will illuminate in RED and the ice maker will stop working automatically. Once you add water to the unit, the indicator will turn off and the ice maker will resume normal operation. When the ice basket is full, the indicator will illuminate in RED. The indicator will remain lit until the ice in the basket either melts away slowly or has been removed. The unit will stay in a “Standby” mode until the ice has been removed / melted at which time the unit will automatically start operation as normal. The Whynter IMC-270MR ice maker stores up to 1.5 lbs of ice. The Whynter IMC-270MR ice maker may make sounds that are not familiar to you. Hard surfaces like the floor, walls can make the sounds seem louder than they actually are. Auto shut-off when ice bin is full. No drain required – water from melted ice cubes is filtered and re-used. Don’t you want to enjoy the magic of chilled drinks daily in the scorching heat of the sun? The Whynter IMC-270MR ice maker produces approximately 9 ice cubes every 10 to 15 minutes Depending on the size of the cube is selected. When the ambient temperature is lower than 59ºF, the small ice cube size is recommended to avoid ice cubes clumping together. For best performance, water temperature should be between 55ºF and 85ºF and ambient temperature between 65ºF and 77ºF. The Color of this Whynter IMC-270MR Compact Ice Maker is Metallic Silver color. Metallic silver color – Adds sleek style to your production. With its simple design and silver texture, this portable ice machine from Whynter will match any setting, whether it’s in your kitchen, sitting at the bar, or out by the pool. It weighs only 19 pounds, so it’s portable and easy to move. These ice makers have a drain at the bottom to empty and clean. This Compact Ice Maker Machine is Available in Three Colors. Locate the Whynter IMC-270MR Compact Portable Ice Maker away from direct sunlight and sources of heat. Direct sunlight may affect the acrylic coating, and heat sources may increase electrical consumption. Extreme cold ambient temperatures may also cause the ice maker not to perform properly. Plug the ice maker into an exclusive properly installed-grounded wall outlet. Do not under any Circumstances cut or remove the third (ground) prong from the power cord. Important: Do not install the Ice maker near an oven, radiator, or other heat sources. Select bullet size or cube Sizes of Ice. Complementary Metallic Silver looks great with home decor. Lighted indicators remind you to add water and empty ice. Makes fresh ice Within 6 minutes. Produces up to 27 lbs. of ice daily. 1 Year Limited Manufacturers Warranty and Three Year Warranty on Compressor. This Product doesn’t have Self-Cleaning Function. We have to Clean Manually. This Whynter IMC-270MS Compact Ice Maker Provides One year limited warranty and Three Year Warranty on Compressor. This Ice is warranted, to the original owner within the 48 continental states, for one year from the date of purchase against defects in material and workmanship under normal use and service. Customer Service: To obtain the Customer Service or information, contact Whynter LLC via email at service @ whynter.com or call 866-WHYNTER. Never clean appliance parts with flammable fluids. The fumes can create a fire hazard. Do not use an excessively wet cloth, industrial solvents, and oil-based products to clean this appliance. Do not store or use gasoline or any other flammable vapors and liquids in the vicinity of this or any other appliance. The fumes can create a fire hazard. Ensure objects are not obstructing the air vent. Never insert your fingers or other objects into the air outlets. 89% of the Customers recommended this Product. There are overall 36 Portable Ice Maker Reviews on this Product on Amazon. Most of the customers seem to be happy with their purchase, as the product has an average customer rating of 4.3 out of five stars. Based on the nature of the product and the high amount of reviews it has received, it is a popular product, and most of the customers seem to be happy with their purchase. Here we have given the Whynter IMC-270MR Compact Portable Ice Maker reviews. I have had portable ice makers for years. I think that is important when reviewing an ice maker, because if someone has never owned another one to compare this one to they may be inclined to give five stars because it DOES make ice. As compared to others that I have owned, this machine is super tiny. The full capacity of ice will fill ONE large glass. Also, it takes longer to make that one glass full of ice than other similarly priced machines. The machine is noisier, and there are only two cube sizes, both smaller than I prefer. The color is not a stainless..but a very blah looking gray. It is not attractive on the counter. Whynter Under Counter Ice Makers will produce more ice when compared to the Whynter Compact Ice Machine. This thing is awesome, but set your expectations right, this is a small unit and will produce ice within 7-8 minutes (9 small pieces). This won’t produce the same amount of ice a freezer would and this ice maker is not refrigerated so the ice left in the tray for a long time will melt into the water reservoir which will be remade into ice. This would be a good use for small camping or on your office desk. For parties, you must look elsewhere. This unit runs at around 103 watts when in use, not bad at all. There are light bulbs that use more power than this. Overall, I am happy with this product, just set your expectations right and you will be very happy. Whynter Portable ice maker has a lot to offer for such a reasonably priced appliance. It’s easy to use, it makes a lot of ice and provided with all of the essential features needed to simplify the process. Finally, you may want to look for a lengthy warranty and the Best compact Ice Machine you should also examine the reputation of the brand and you will satisfy by buying this product. Good luck!